How might I teach the Declaration of Independence to high school students who are visual and verbal learners? What films or reading assignments will engage them, and yet not overwhelm them with the sometimes difficult wording of the Declaration itself? Ah, the Declaration of Independence, a document so essential to understanding our American past and present that every student should read and learn about it. Luckily, its ideas and historical significance are truly engaging and can help make its difficult eighteenth century prose more accessible for our students. As far as reading the document, we suggest two intertwined approaches (both to be used with a transcribed version). 1. Help students see the structure of the document so they know what to expect. Show them how it moves from initial paragraphs that get what the states are doing and why, to a list of specific grievances, to assurances that these are not capricious complaints or actions and then the ultimate declaration. 2. Plan activities where they read excerpts from the document closely and carefully. Phrases and sentences work here—select them carefully and scaffold student work with strategies like pair work, paraphrasing, and vocabulary help. Looking at the original documenthref>. Sign the documenthref>. Have students find the anomaly (your signature) on a handout or decide whether to sign on themselves after considering the stories behind the signers href>and the historical moment. Look at the rough draft of the Declarationhref> or use this lesson planhref> which involves a careful comparison between the drafts. 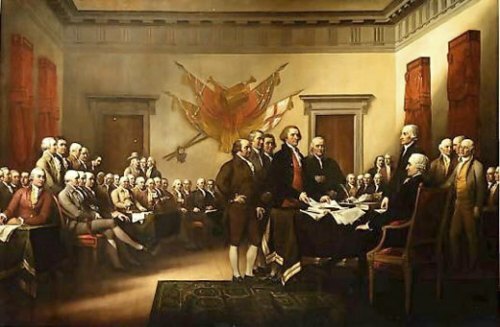 For a primer on the document, see this historian’s helpful discussionhref> that includes a consideration of the historical events surrounding the Declaration, analyses of particular excerpts and its consequences and legacy. Connect with images. For example, this onehref> or this onehref>. Admittedly, we focus on the reading of the document. There are several resources like the recent film National Treasurehref>, the older film 1776href>, or the Independence episode of the recent TV miniseries John Adamshref> that some teachers use to talk about the Declaration of Independence. A new way to bring visual learners to the text of the Declaration is through YouTube. Your students may be interested in this video clip of well-known actors reading the Declarationhref> in its entirety . While these resources could be used to accompany the kinds of reading activities we mention here, it would be too bad if they trumped the actual Declaration, a document that talked about equality before our Constitution did and deserves every student’s eye.